The best thing about being a Haven Maven is that we get to experience cool places and things, photograph them and then write about them here in this blog. ​It is, after all, exactly the kind of thing that we do for our clients. The Mavens were on the look-out for an outing that would speak to the topic of experiential tourism, the latest and greatest trend in the tourism industry. Experiential tourism involves immersing yourself in a country, city or place and making connections with people, history and culture. 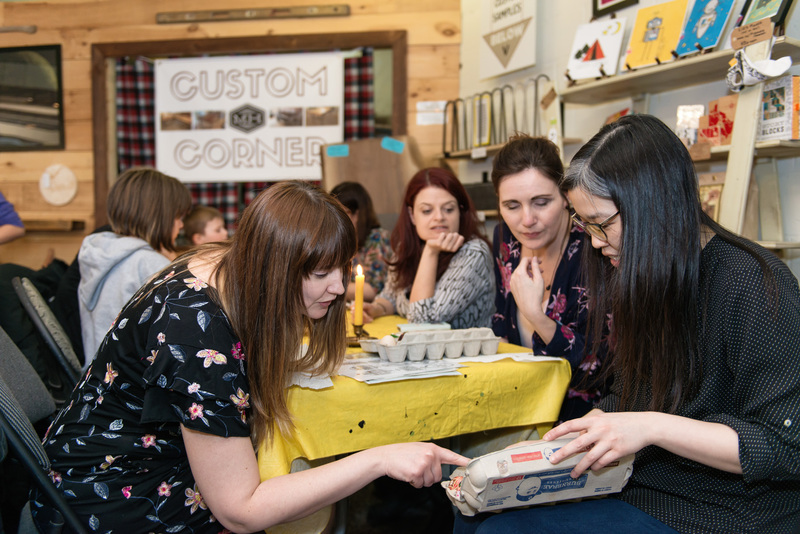 When we heard about a pysanky workshop hosted by Folk Camp Canada at Ottawa’s Maker House, we knew we found the perfect fit. 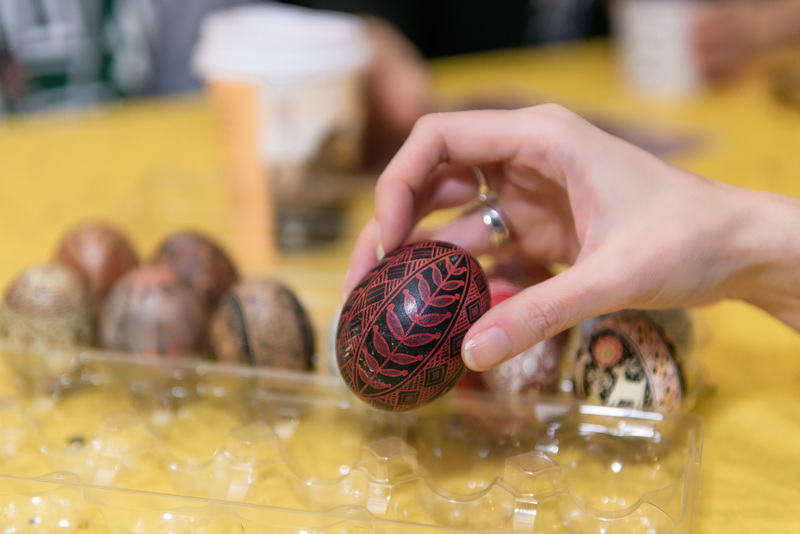 We were lucky enough to nab the last seats for the Mavens and settled in to learn the art and craft of decorating traditional Ukrainian Easter eggs. 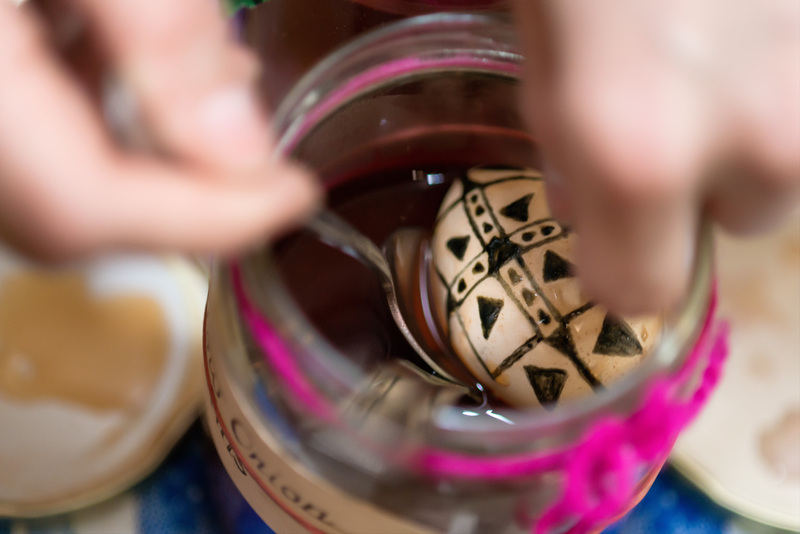 Pysanky dyed with natural ingredients. Here are the examples that our host brought for us. Our final products were significantly less awesome. The fact that this session was sold out makes a lot of sense. If you pay attention to trends, you’ll notice that there is an increased interest in the folk arts these days, and it is organizations like Folk Camp Canada that are meeting the demand. 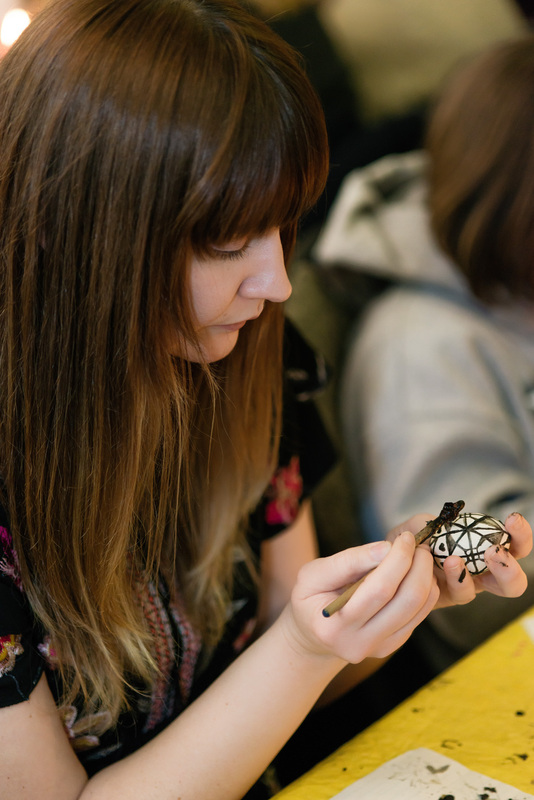 This not-for-profit organization is dedicated to providing accessible community programming in the folk arts, with a particular attention to the cultural traditions of East Europe. The Folk Camp mission is to bring people closer to the earth and one another through folk art tradition. 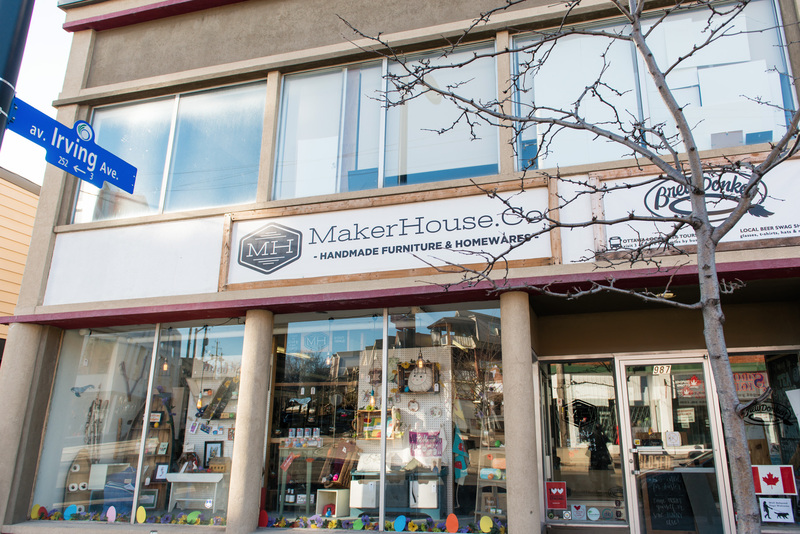 Maker House is located in the trendy Wellington West neighbourhood of Ottawa. At first glance you might think that this is just your typical gift store. 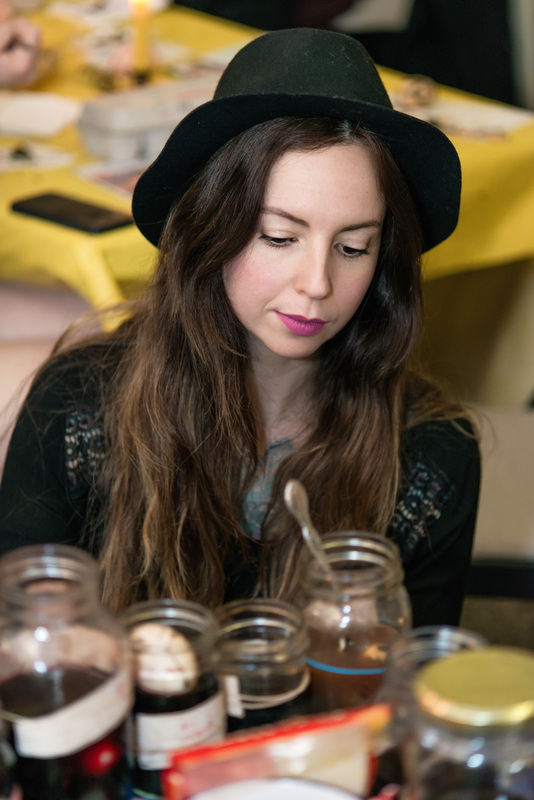 If you look a little closer, you’ll learn that it is a network of local makers that generates sales for more than 100 artisans across Canada. They also donate 2% of all sales to non-profit organizations. 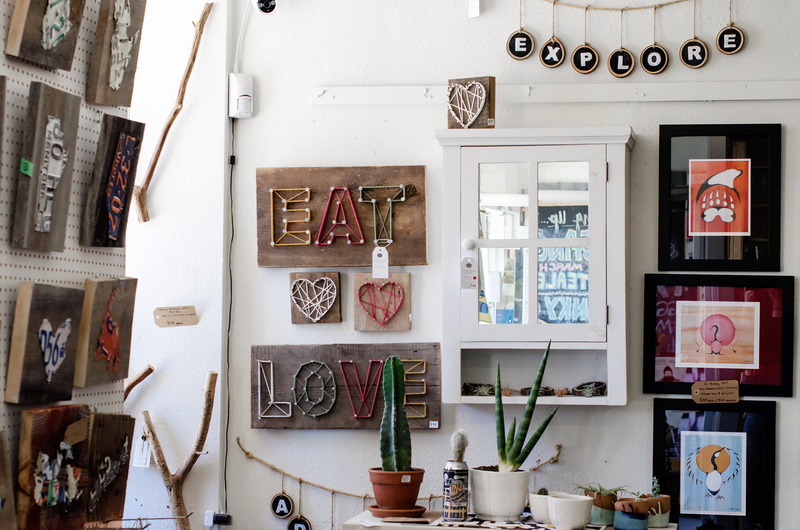 ​Walking into Maker House, you are immediately struck by the array of beautiful hand-crafted homeware and handmade furniture. 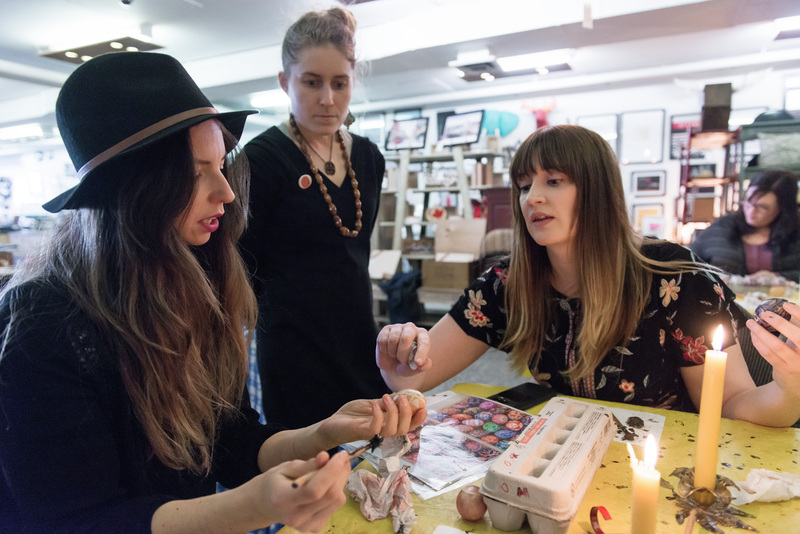 The creative energy vibrating throughout the store was the perfect setting to gather with community and learn the ancient craft of pysanky. 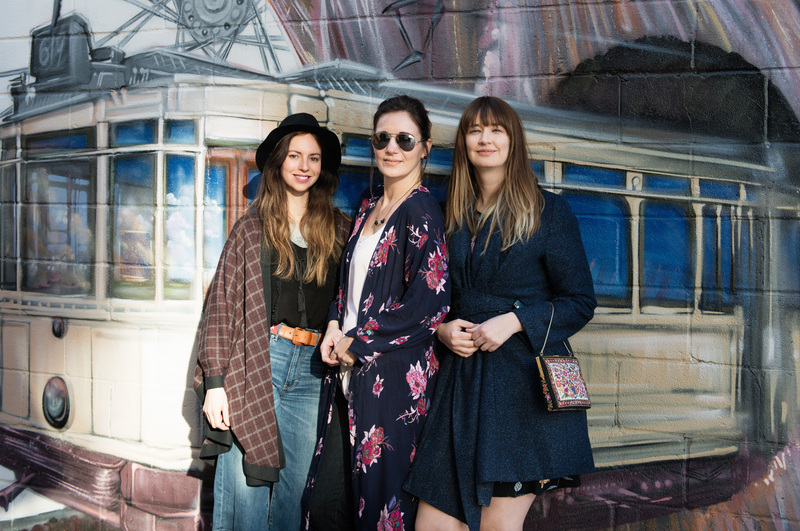 We couldn’t resist this Wellington West ​mural​! 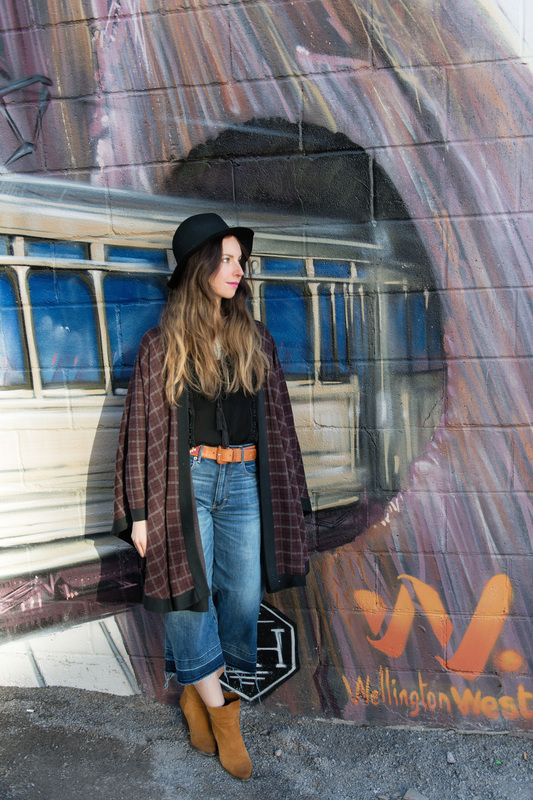 ​With Jess looking stylish in her Boho inspired outfit, we insisted she do a pose for us. Pysanky (pih-sahn-KIH) is the plural form of pysanka (PIH-sahn-kah). 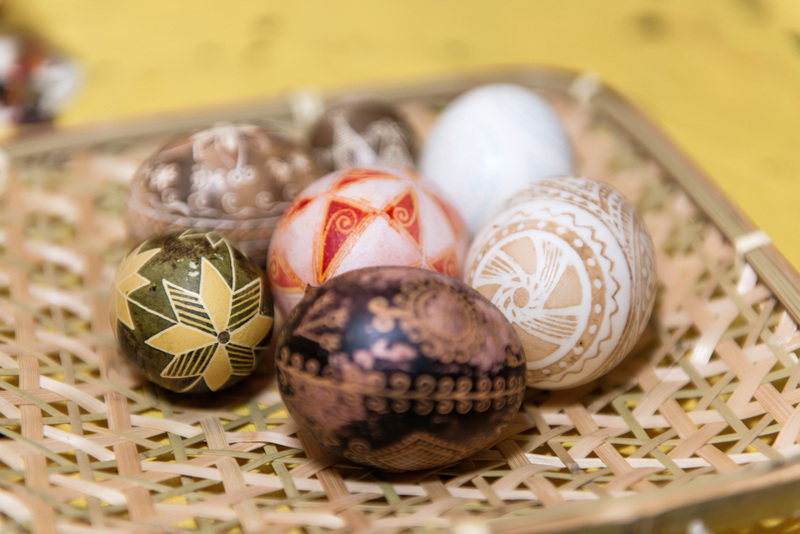 A pysanka is an Easter egg decorated using a wax-resist method, a similar process to batik for fabrics. The name is derived from the Ukrainian verb “pysaty”, which means “to write”. But it really is much more than that. 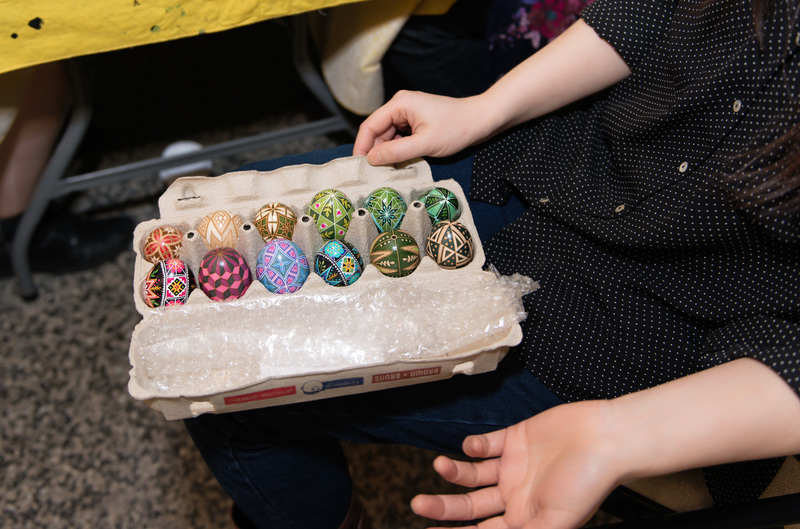 Ukrainians have been decorating eggs for generations and there is a ritualistic and almost meditative element to the process. ​If you grew up in Canada, you may remember this classic video from 1978. 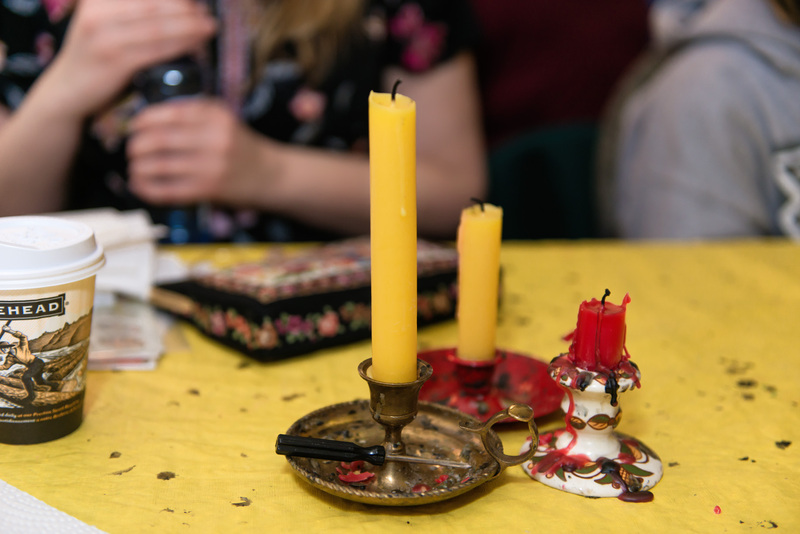 At the workshop, we sat around tables speckled in drips of black beeswax from the previous session. Though we imagined our own uses for the tools that lay before us, we soon learned that the supplies required for this craft are actually quite basic. The Mavens explore the tools laid before us. Looks like Jess is trying to ward off evil spirits. Are we doing it right? 1. A kistka: This is the most specialized tool that you need. It is a little stick, about the size of a pen, with a metal funnel affixed to one end. It is what you use to draw your patterns on the egg with beeswax. 2. Beeswax candles: You need a candle to heat up your kistka. Once heated, you scoop some beeswax into your funnel, and then heat it again until the wax starts flowing out of the tip. You’ll also use the candle to melt the wax off your egg at the end of the process to reveal your design. ​We never did find out what the miniature screwdriver was for. ​3. Beeswax: For scooping and writing. 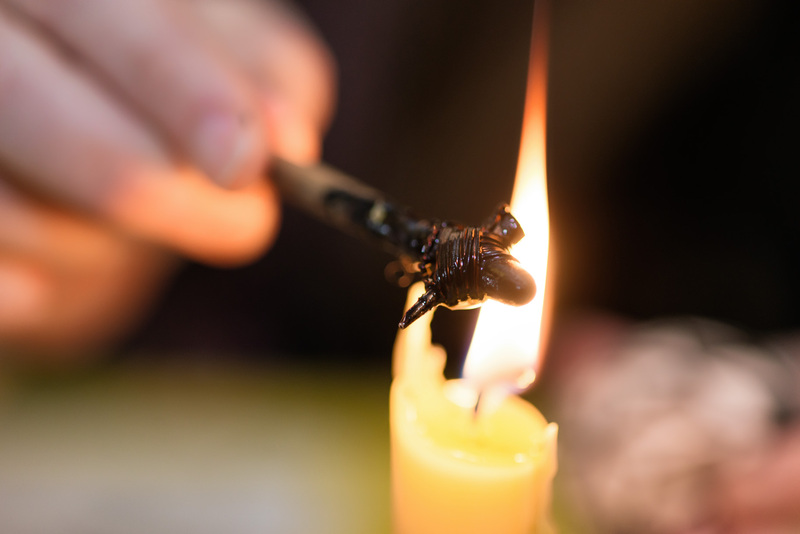 The beeswax will mix with the soot from the flame and the wax turns black, making it easy to see your design. ​4. 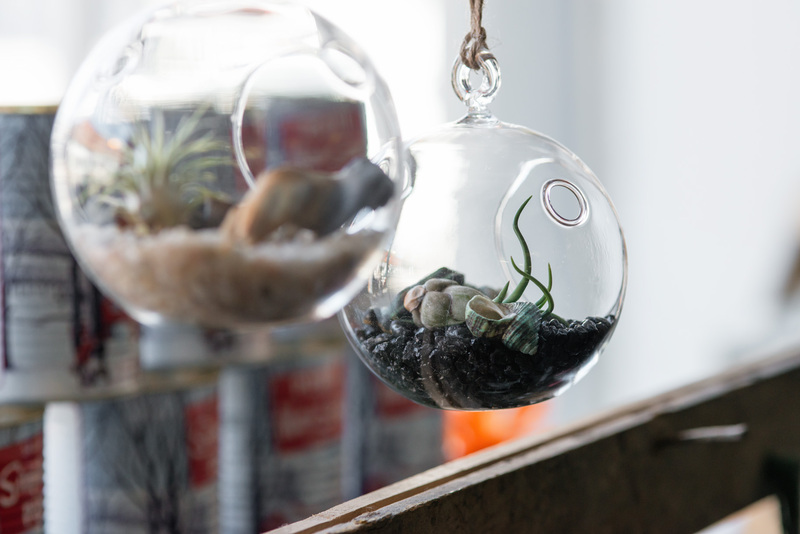 Eggs: Of course, you need eggs to decorate! Simple chicken eggs from the grocery store is all you need to get started. Make sure they are washed ​and are sitting at room temperature. For best results wash with a diluted vinegar solution. 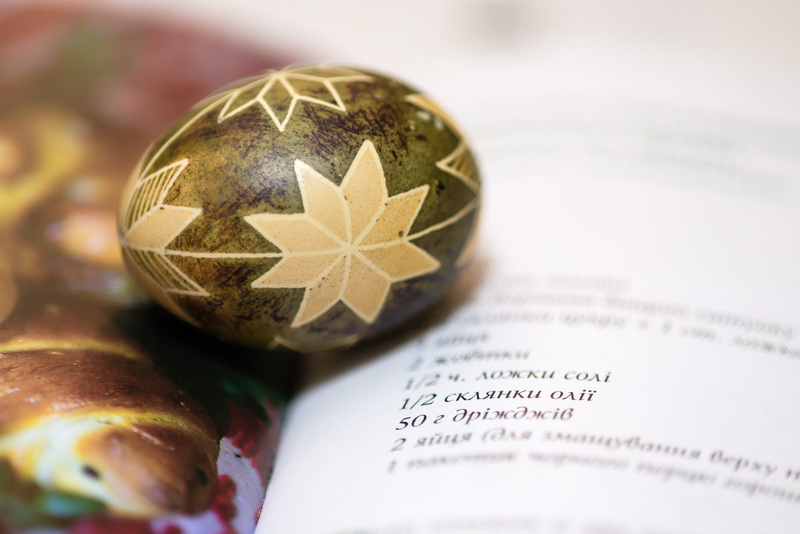 You may also “blow out” your egg, though traditionally the eggs are left whole, they will eventually dry out. 5. Dye: You can buy vibrant coloured dye from nearly any craft supply store, or in our case, make your own out of items you can find in nature such as red cabbage, onion skins, and walnuts. 6. Other: you’ll probably want to cover your table with newspaper or a plastic table cloth, and you’ll want to keep some paper towel on hand to dry your eggs after they’ve been dyed. 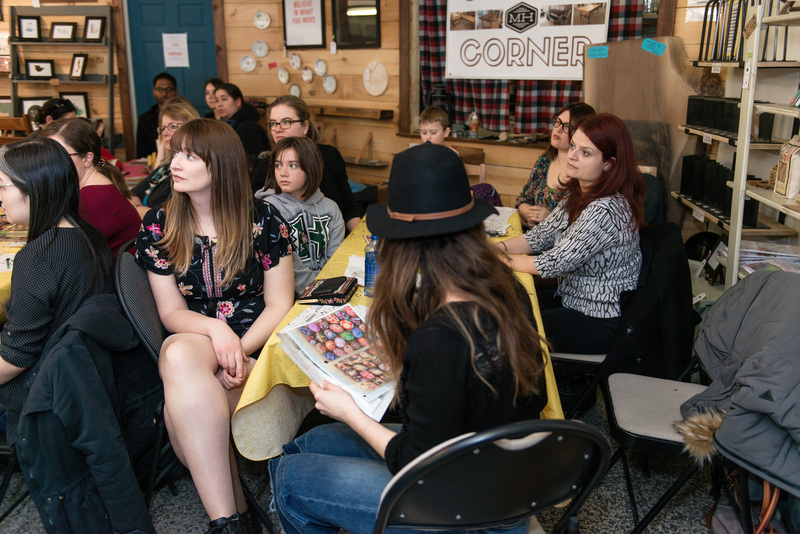 The workshop began with our host, Bozena, briefly speaking about the tradition of pysanka and then getting right into the how of making natural dyes. ​Collect the skins of your yellow onions all year round, and then boil them down into yellow dye for your pysanky . Bozena brought an array of dyes that she had prepared ahead of time. Some of the concoctions are recipes that she has been experimenting with over many years, in every season. Turmeric (yellow): You’ll want to visit an Indian food store to purchase it cheaply and in bulk. Yellow onion peel (orange): Collect the dry onion peels throughout the years. Don’t collect the wet ones or they will mould in storage. Cochineal (pink): This is an insect that is found in Mexico (all natural but NOT vegan). You can order them on the internet. Sumac berries (pinkish red): You can find this tree growing all over the Ottawa valley. 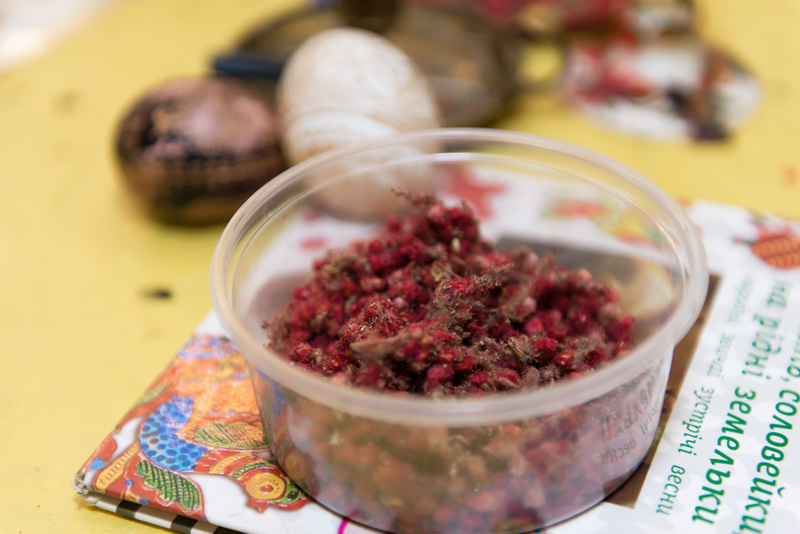 ​This is dried sumac berries before they are turned into dye. They grow everwhere here in the Ottawa valley. This ingredient yields a delightful pink colour. Blueberries (blue): You can just use the frozen berries found at the grocery store, but wild blueberries are best. Red cabbage (lavender): This is the one that gave the most vibrant colour of the day. Black Tea (dark brown): Get the cheapest, blackest tea you can find and let it steep for a long time. Black Walnuts (black): Bozena gathered 2 bushels of them last fall and says if you need some to give her a call! Turns out, the tree in the Neighbour Mavens'* local park that leaves nuts all over the place are the exact kind you need. * The "Neighbour Mavens" are Jen, Stacey and Jess. They all live rurally and work out of their homes in a secluded forested neighbourhood that is located far beyond the outskirts of Ottawa. ​The natural dyes can be quite delicate. In this picture you can see that the black tea has rubbed off a bit. There is definitely something to be said for the distressed look. ​Natural dyes need to be boiled down with a mordant, such as iron, alum, or copper, to help the dye adhere to material. If you’re going to create your own dyes, it’s best to boil them down in an iron pot, or to throw in a piece of steel wool. 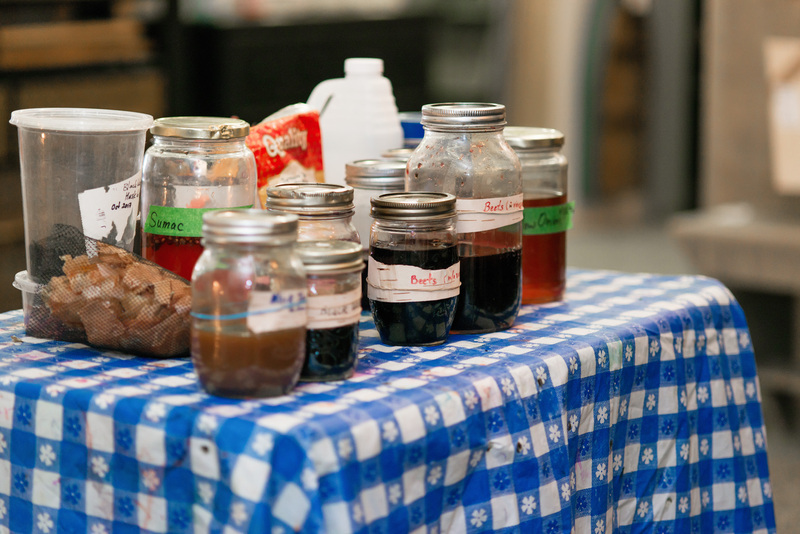 Some of the dyes were also made with vinegar and salt, fixatives that help set the dye. 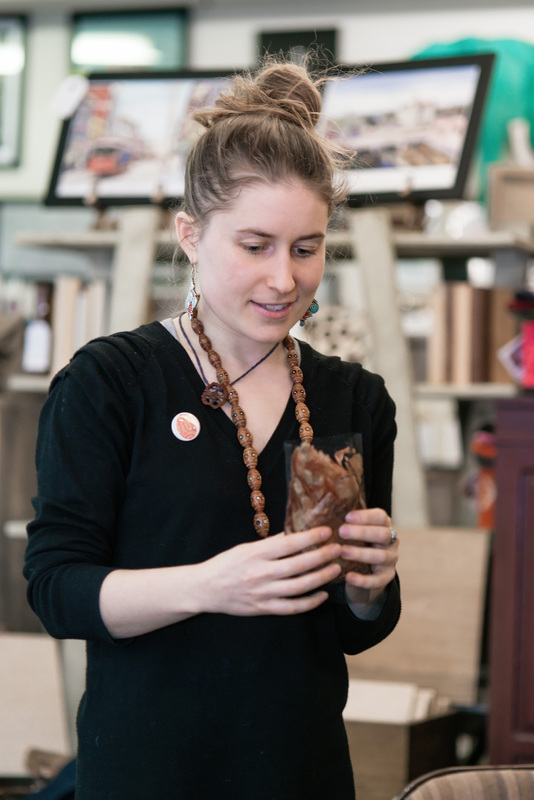 ​One of the students Jennifer E Kwong of Happy Egging ​is also a practiced artisan. 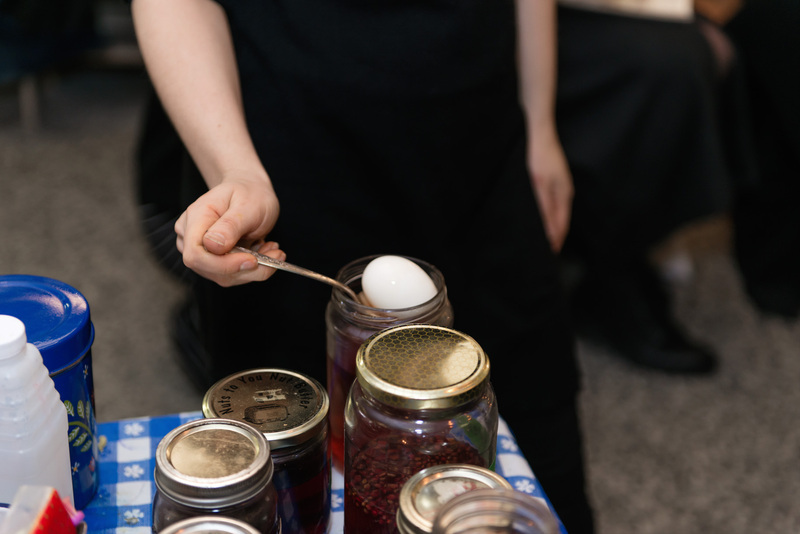 She showed us some of the eggs that she created using the more common store-bought chemical dyes. Aren't her eggs so beautifully symmetric? You really need to look ​to click through to both her Instagram and Facebook page. Did you know there was such a thing ​as an egg lathe? Step 1: Decide on a design. ​Some of us Mavens learned a lot about ourselves. Sometimes the “do whatever you feel and everything will work out” method is not the best approach. That said, there is definitely an element of just going with the flow and seeing what happens. It’s a great way to learn! Some people will choose to draw the lines with pencil first, though this is not the traditional approach. ​Heat the funnel of the kistka in the flame. The heated funnel will melt the beeswax as you scoop it into your tool. You may need to reheat your scoop to get the wax flowing. 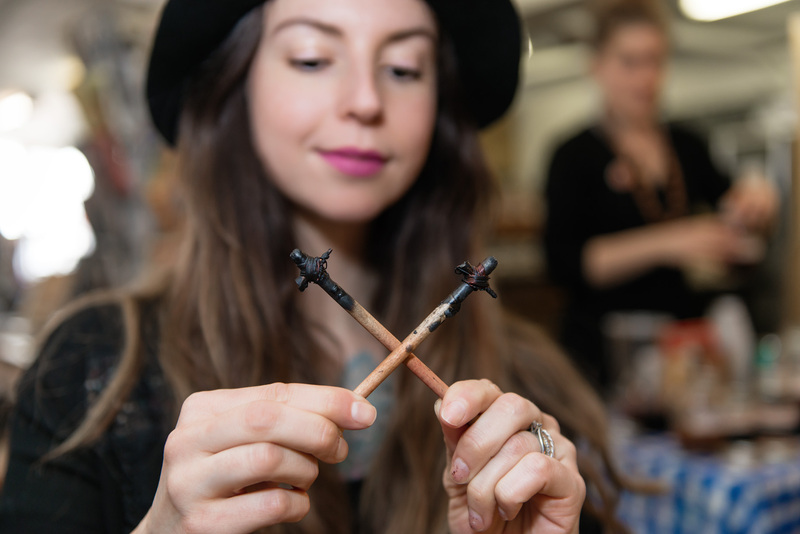 When doing this, try to avoid sticking the tip of your tool into the flame, as soot from the flame can create clogs and the goal is to get your wax flowing smoothly. Caution: don’t stick the wooden part of the tool into the flame, this will cause FIRE! ...right, Jess?! 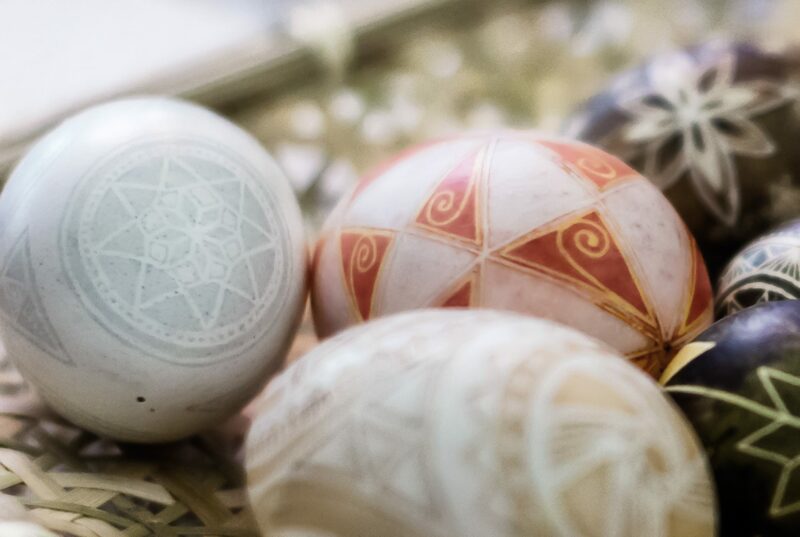 ​If you’re not following a specific design, a good place to start is by dividing your egg up into sections, and then creating geometrical patterns from there. As you go, soot on the kistka will mix with the wax and darken it, making it easy to see your design. As you know, symmetry is naturally beautiful, so if you’re looking for an easy win, be consistent, and stick to a pattern. The best way to get a straight, fine line, is to draw quickly and with confidence. Of course, this takes practice and learning how to get that wax flowing evenly. Some people anchor their pinky finger onto the egg to steady their hand, others find it easier to simply move the egg and keep their hand in a fixed position. The only way to learn what works best for you is to practice. ​Carefully lower your egg into the dye with a spoon. Do not drop the egg! You would hate to put in all the work of decorating your egg only to find later, during the wax removal step, that your egg was cracked. The natural dyes we were using take longer to set than the chemical dyes. So patience is definitely a virtue here. We found that the cochineal and the red cabbage dyes yielded the fastest ​results. ​When your egg reaches the colour you are looking for, remove it by lifting the spoon and then pick it up with a paper towel. Pat the excess dye off the egg. ​Now that you have the first layer completed, any lines you drew will be the same color as the egg shell (unless, of course, you dyed your entire egg before drawing anything). Drawing on your newly dyed layered will mean your next set of lines will be the same colour as the dye. Repeating this process is how you achieve multi-coloured eggs. It’s worth noting that you’ll want to dye your egg going from yellow through to black​, dying over your previous colour every time. You can, of course, skip colours but you won’t be able to go backwards and dye a lighter colour over a darker colour. Step 6: Removing the wax. 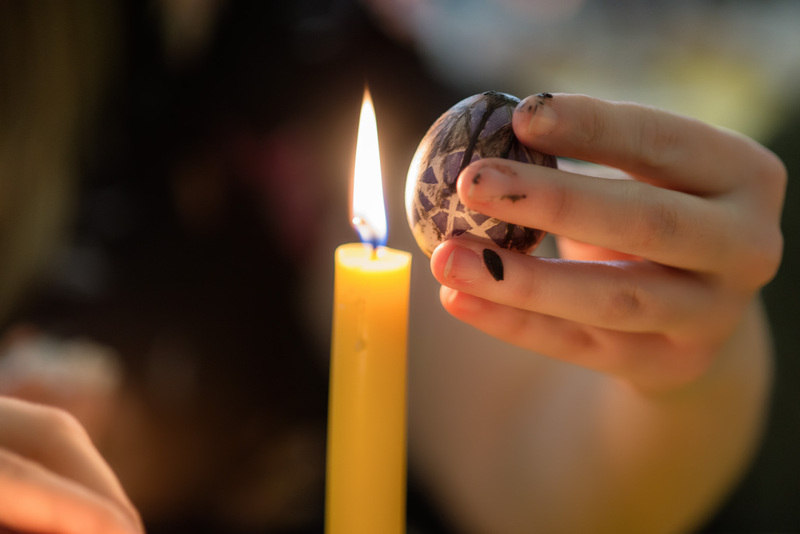 ​Hold your egg up NEXT to the flame, until the wax begins to melt and then wipe away the wax with a paper towel. Holding the egg directly into the flame can transfer soot onto the surface, and your egg will be forever marred (like some of ours were). Bozena suggested another method, where you blow out the innards of your egg, and then heat the egg in the oven (with the door open, keeping a close eye on it). ​That’s the process in a nutshell! You may also want to varnish your finished product, however the workshop didn’t get into that much detail. WARNING: do not use this blog post as a sole source of information should you decide to try this craft. ​There are plenty of resources online with much more thorough instructions, however, the best way to learn is to do what we did and learn with a teacher by your side. 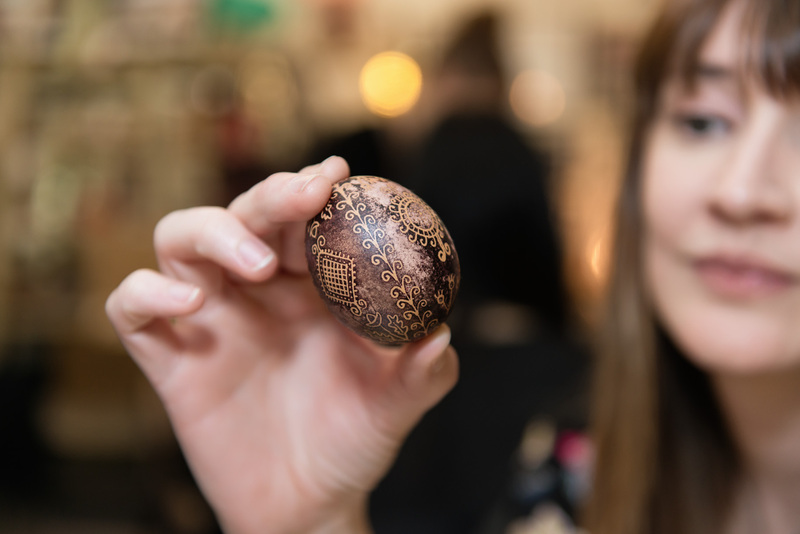 Practicing the art of pysanky isn’t just about drawing on an egg, it is just as much about creating memories as you gather around a table, passing along your knowledge and sharing in the joy of creation. Thank you, Folk Camp Canada! We strongly encourage our readers to learn more about Folk Camp and the Kosa Kolective! Folk Camp runs workshops thoughout the year throughout Ontario. You can learn about the different learning opportunities that they offer on the folk camp website. ​The "Neighbour Mavens". Next time you're in the neighbourhood, come on over for some pysanky-ing! (Maven Jen ordered a kit online the minute she got home). ​If you've read this far​, ​CONGRATULATION​S, you ​now have everything you need to become amateur pysanky folk artists like the Mavens. Thank you for ​sharing in the joy of creation with us​, and HAPPY EASTER! We like to spend our days being tourists in our own town. Check out our misadventures as we attempt to attend Winterlude one fateful Wednesday morning.